A metaphor is a figure of speech that is used to describe something by comparing it to something totally different, so much so that the two things that are not at all common in the literal sense. दिल टूटना एक metaphor है अत्यंत दुःख को ज़ाहिर करने के लिए। We all know that your heart is not literally broken into pieces; you just feel hurt and sad and that’s what has been compared with the pain of a broken heart. Though metaphors are all about describing by comparing, they should never be taken seriously as it won’t make any sense and you’ll be left wondering and confused. ♦ Also, Metaphors are made up of colorful words and phrases which sometimes can be quite funny and entertaining. Now, there is a sea of metaphors out there, but then I can’t tell you all of them. So, here I have a collection of few which will give you a fair idea of what metaphors are. • You must read this book, it’s a food fo thought. • After my experience, all I can say is that love is a battlefield. • Last year was a like roller-coaster of emotions for me. • Ever since I sent him to the boarding school, he has simmered down a lot. • After so much of hard work, Sally had the sweet taste of success. • Your plan sounds like a house of cards to me. • The police officer listened to his lies with a wooden face. • I never thought that my best friend would leave me high and dry. 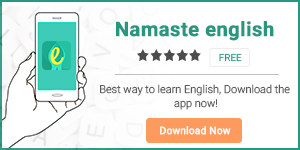 To learn more about such interesting communication skills, download our English learning app Namaste English.